As reported around the internet, especially on interfax-religion , Pat. Kyrill stated on his television program that the MP did not refuse at all to cooperate with the God-hating Soviet forces, “wherever this was possible, where instruments of dialogue, however small, could be used to assert the moral standards and spiritual principles in our people’s life,” he said. Pat. Kyrill isn’t lying. He and his cohorts will cooperate with anyone in power so long as it maintains their power and prestige. With church attendance rate in MP parishes at all time lows (the MP could only muster 1 or 2% to attend Nativity or Pascha), along with the well-known corruption present in the Sergianist Patriarchate, the last arm of the Soviet government seeks to what ever is possible to maintain it’s authority. As noted, it has everything necessary to deploy Sergianist militia forces that will be a para-government police force of sorts. 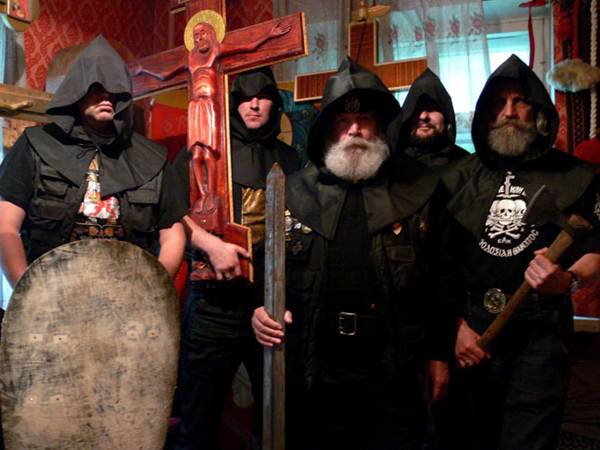 With the recent renewal of assaults upon the True Orthodox in Suzdal (the ROAC under Met. 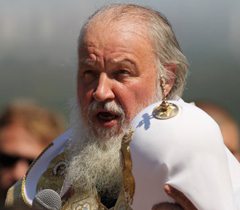 Theodore), as well as incidence of violence or persecution in Russia against the more popular True Orthodox increase, the gasping violence of the moribund body of the Sergianists will become more pronounced. And, where are all these multitudes of traditionalist priests and bishops throughout the MP that were supposedly in heavy and/or complete agreement with the ROCOR? Where is the resurrection of Russia? With MP hierarchs still engaged in ecumenical activities (i.e., visiting the pope, the Patriarch attending the World Congress of Religions, the MP bishop of Minsk presiding over joint mock communion services with Lutherans and Uniates, etc), where are all the throngs of traditionalist MP clergy and monastics who writings letters and calling their bishops complaining about all this? Perhaps they are there, but, they need to call louder; perhaps their bishops or Patriarch is on some journey. “As previously, the Church will not come off this track, whichever government may holds the reigns of power, because the Church is not an opposition force,” the Patriarch said. Indeed; the Church apparently is not an opposition force. St. Ambrose, St. Athanasius, St. Maximus, St. Martin, etc, were apparently just content to say nothing? Maybe Pat. Kyrill should be reminded of what St. Ambrose did when the emperor killed thousands in a bread riot in Thessalonika?